CRUMPACKER, Edgar Dean, (father of Maurice Edgar Crumpacker and cousin of Shepard J. Crumpacker, Jr.), a Representative from Indiana; born in Westville, La Porte County, Ind., May 27, 1851; attended the common schools and Valparaiso Academy, Valparaiso, Ind. ; studied law in the law department of Indiana University at Bloomington; was admitted to the bar in 1876 and commenced practice in Valparaiso, Ind. 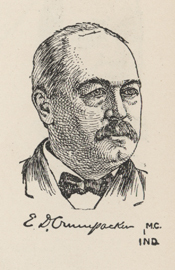 ; prosecuting attorney for the thirty-first judicial district of Indiana 1884-1888; served as appellate judge, by appointment of Governor Hovey, from March 1891 to January 1, 1893; elected as a Republican to the Fifty-fifth and to the seven succeeding Congresses (March 4, 1897-March 3, 1913); chairman, Committee on the Census (Fifty-eighth through Sixty-first Congresses); unsuccessful candidate for reelection in 1912 to the Sixty-third Congress; resumed the practice of law in Valparaiso, Porter County, Ind., where he died May 19, 1920; interment in Graceland Cemetery. Papers: In the Abraham Lincoln Brick Papers, 1853-1950, 6 boxes. Correspondents include Edgar D. Crumpacker. ------. Contested-election case. Thorp vs. Epes. Washington: [Government Printing Office], 1898. ------. The Porto Rican tariff. Washington: [Government Printing Office], 1900. ------. War taxes. Remarks of Hon. E.D. Crumpacker, of Indiana, in the House of Representatives, April 28, 1898. Washington: [Government Printing Office], 1898.